backpack, you'll be working hard enough to push your heart rate up through the roof. (to running levels in fact). Why? Well, If you think about it, you're lifting your bodyweight against gravity with every step so it's a bit like resistance training. That's a big difference from flat walking where loads are significantly less, and a problem if you only get out on the hills occasionally. So, if you find walking up hills hard, what can you do about it? Here's a few tips that could help you motor up that hill next time out. Don't be tempted to go screaming into things. You want to choose a nice, steady pace that you can sustain over a long period. Whatever you do, don't push yourself until you become breathless and your legs are burning as you'll be asking for trouble later. What then happens is that you use hard-to-replace glycogen reserves and build up lactate chemicals in your muscles that will make you less efficient for the rest of walk. That just about wraps it up from The Mountain goat, and we thank him for all the valuable information he’s given us when it comes to getting up and over those steep hills. If you really want to see the Mountain Goat’s home town mountain range in all its glory, watch the hair raising video below of a summit hike on Devil’s Castle, courtesy of Utah Pictures, who kindly provide the mountain goat pictures to us. 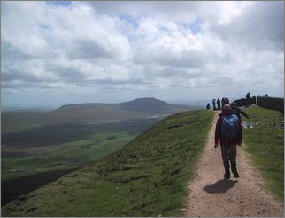 Note that the climb is being undertaken whilst the hiker is using one hand to operate the hand held video camera! 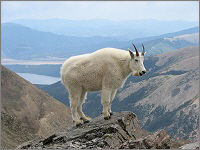 The Mountain Goat at rest at the top of another difficult climb. 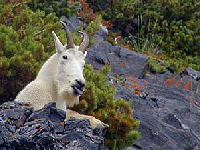 The Mountain Goat takes time out from providing all those useful hints and tips on hill walking to relax on the rocky slopes. 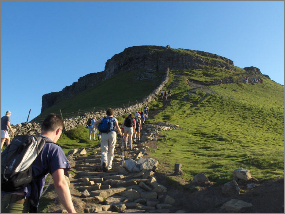 If you're new to hill-walking, try to build up your general fitness level in advance. This doesn't have to mean expensive trips to gyms, instead take any and all opportunities to walk actively on the flat, walk (or eventually run!) up steps or the stairs at home or in the office. Your feet are your best friends when hill walking - so treat them well. Your choice of footwear is determined largely by the type of walking you want to do. Boots for general walking will be designed to offer relatively more flexibility and often come in the form of low-cut walking boots or shoes. Boots for higher level walking on rockier, steeper ground will tend to have stiffer soles and be cut to offer a greater level of support. Hill-walking presents a greater aerobic challenge to your body and uses the muscles in the front of your thighs and your buttocks to a greater extent than otherwise. So warm-up first by walking for about 10 minutes on the flat. In the same way that you use a lower gear in a car to go up a hill, you should shorten your stride when you walk up hill. If possible, try to keep up the same rate of steps but just take shorter ones. Aside from not putting too much strain on hip and knee joints, this should also allow you to balance yourself and place your feet more carefully so that you avoid slipping. Lean slightly into the hill but try to maintain your balance by keeping your torso over your hips. As stated above, if possible, try to keep up the same rate of steps but just take shorter ones. Aside from not putting too much strain on hip and knee joints, this should also allow you to balance yourself and place your feet more carefully so that you avoid slipping. Walking poles can be a great help when going uphill - they allow you transfer some of the load to your arms and allow you to set a rhythm for your walking. You will need to shorten your poles for up-hill sections.It may be worthwhile considering poles that allow the anti-shock system to be turned off for uphill use. Unless super fit - slow down so that you're not depleting your carbohydrate sources too quickly. 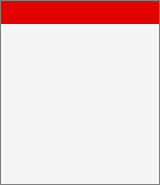 Avoid having to go so quickly you can only spit out single words. A slow, steady pace is better than a fast one punctuated with lots of stops. Anyway, you're there for the views as well, right? Try to maintain a slow, regular breathing pattern. Try to properly fill your lungs from the base of your abdomen. (If you're also a singer you'll have a head-start here!) Avoid breathing so that your shoulders are going up and down. In cold weather, breathe through your nose so that the air is warmed. The 'route 1' straight up approach may look the quickest - but in most cases it isn't. It's far preferable to reduce the gradient by picking a more zig-zagging route. Yes - the distance travelled will be greater but it will enable you keep a steadier, more consistent pace. Generally speaking, it's best to try and avoid scree. However, that's not always possible. If it is unavoidable try to keep your foot flat (to spread your weight over as great an area as possible). Try to step onto large flatter stones or clumps of vegetation. In case you disturb the scree, look out for other walkers below you (and also above you in case they're not as considerate as you). As in many other challenges, your attitude in approaching a hill-climb is nearly as important as your technique. Yes - assess where you are heading, but don't keep looking at that seemingly way-off summit. Give yourself lots of smaller destination points along the route - and reward yourself when you reach each one. This may also be a good opportunity to practice your singing (in your head?! ), chant Italian verb conjugations (definitely in your head), count your paces - or whatever else helps you maintain your walking rhythm. Enjoy yourself... Remember, this is supposed to be fun. Better to stop and have a quick breather than push yourself into the physiological death zone. You'd be surprised how many people try to take huge steps going uphill. It's actually more efficient to lean slightly into the slope and shorten your stride a little. If you find a spot with a really big step up, look for an intermediate foot hold so you can do it in two paces instead of one and ease the load. Think of stairs - it's easier to breeze up closely-spaced steps than to go striding up huge, widely spaced ones. Watch where you place your feet as well... unsteady foot plants waste energy and make efficient walking more difficult.